Should I stay or should I go? It’s a question many homeowners find themselves asking and lately my husband and I have been pondering this question as well. We love our home. It’s a modest 2500 square foot row home in the city with some fun charm and urban advantage. We bought it as a gutted shell-of-a-house six years ago and worked with contractors to rebuild it from the inside out. Since that time, I have made it over to fit our changing tastes and our family’s needs. But living in the city has some major drawbacks. As the boys get older, my husband and I struggle with whether or not we should move to a more suburban area complete with big backyard and neighborhood playmates. For now, we are staying put (while keeping an eye on the real estate listings). And we want to make sure that the improvements we make to our home will reap some return if and when we decide to sell! What kitchen updates are really necessary in order to get the most when you sell your home? Well, the answers might surprise you! Updated appliances and updated cabinets are really the most important elements—everything else is a matter of opinion and personal taste. I’ll use my kitchen as an example of what I mean. Everything in our kitchen was brand new six years ago. I proudly chose every single thing that you see in the “before” picture. I designed the kitchen layout, chose the cabinets, the hardware, the tiffany light fixtures, the appliances, and the paint color. The Benjamin Moore Million Dollar Red was ALL me. And at the time I adored everything about this kitchen and it couldn’t have been more perfect. But I had been ahead of the game on the popular “red and gold” color scheme and had already lived with these colors since the late 90’s. It took about one year after designing this kitchen for me to begin despising the colors. Instead of feeling warm and cozy, it felt dark, heavy, and oppressive. Being in my own kitchen made me feel irritable and anxious. I painted the cabinets, installed a backsplash, added a screen pantry door, added beams, and changed the light fixtures and I LOVE it. But many people prefer the “before” and identify with the dark warm wood and warmer tones. Many people HATE painted wood and see it as a check against your home rather than an asset. Knowing this, I do not regret the changes I made here one. single. bit. This is our home, and I intend to enjoy it while we are here! If your kitchen looks like my “before” and you are thinking of selling, you don’t need to worry about investing money in the kitchen to update it. A more neutral wall color might help, but the other updates aren’t necessary. To see how we updated our kitchen click here. There is a saying that “kitchens and baths sell homes.” Updating old toilets and exchanging outdated cabinetry for pedestal sinks can produce a return on your investment. 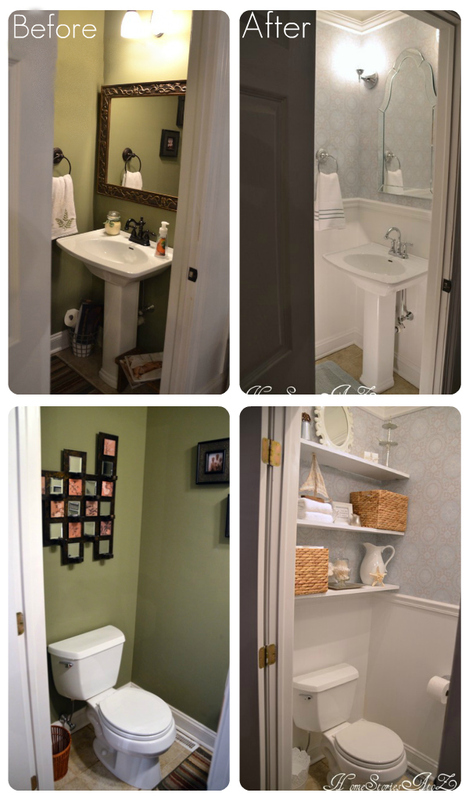 Adding built-in storage to a small bathroom will also boost appeal. 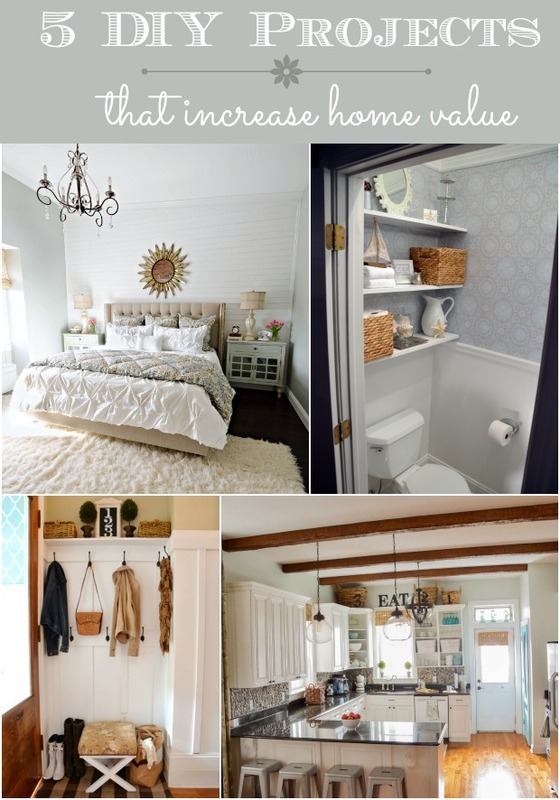 To see how we updated our half bath (with full tutorials) click here. Peeling paint, damaged shingles, and ugly siding should all be freshened up before placing a home on the market. 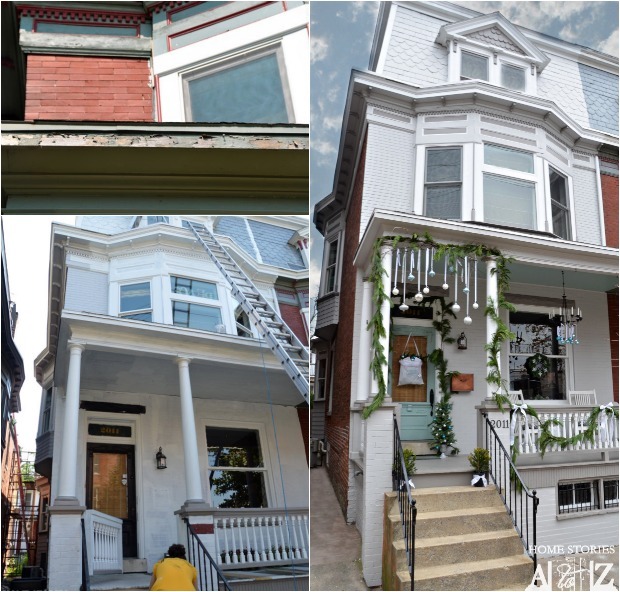 The exterior of our home is very old, but when we renovated our home we had a lot of new molding installed and the exterior painted . You can see below how awful the paint looked just a few years later! Wood rot was setting in and many pieces of moulding needed to be replaced. This wass due to an improper gutter installation issue that needed to be remedied. We replaced some wet wood and had the exterior painted (again) over the summer. 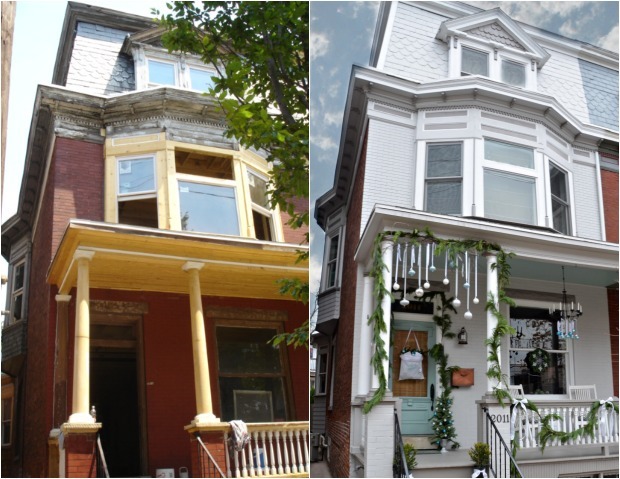 Having a sound exterior is a crucial investment that should be tended to before cosmetic repairs! Crown moulding, board and batten, plank walls, beadboard, and trim all add character and charm to a home and give it a custom, “high-end” look. I don’t think you can go wrong in adding these timeless features to your space! If you are able to do the work yourself, then you should be able to see a return on your investment. And of course freshening up your paint colors is always an easy and inexpensive update that will help your home stand out in a crowd. 1. Our mudroom 2. Our master bedroom 3. Living room (haven’t blogged about the updates here yet). 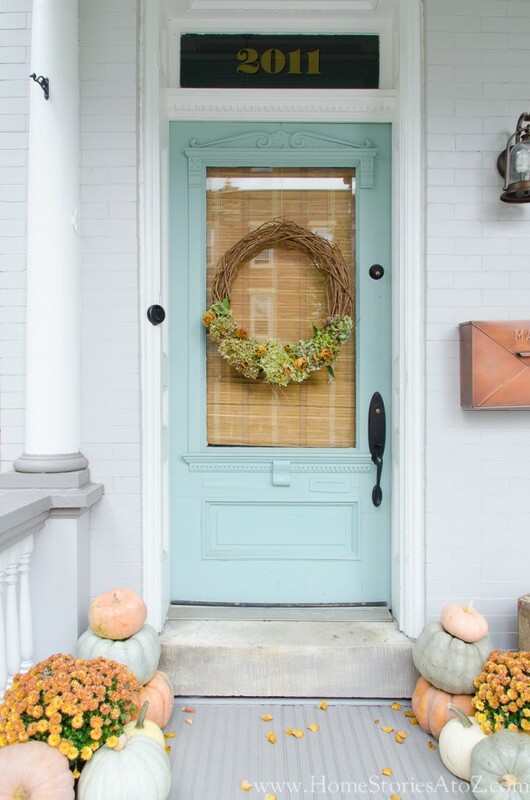 While sometimes I long for a big expansive yard (and I definitely long for a prettier view), creating curb appeal in an urban environment is admittedly a bit easier! We have a tiny back yard, front porch, back porch, and roof deck that need tending to. I love to use creative container gardens in all of these spaces during every season. No matter where you live, pulling weeds, mulching, cutting grass, and planting flowers and container gardens is an easy way to spruce up your outdoor living space. Deciding how much time and money to invest in your current home is a very personal decision. I think most creatives, like myself, who enjoy the art of nesting and see “home” as our “canvas” tend not to worry as much about returns on investments and future homeowners. But as I give further thought to the possibility of moving it definitely changes my perspective on how much might be “too much” to invest in a home where I know we won’t see the financial returns. How about you? How do you make those tough decisions for your own home? If you enjoyed this article, be sure to check out the related posts below. Wonderful! I wish I could do it with our apartment. .. 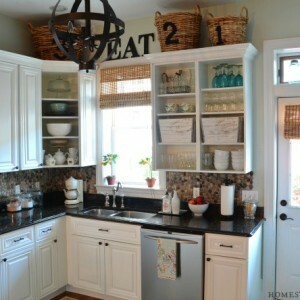 I love your kitchen redo! I am totally with you on how your tastes changing over time. When I first got married at age 20, I liked a very sparse mostly white decor style (partly due to being afraid of color, I’m sure). In my mid twenties, I liked primitive country which changed to French country by my early thirties. I still like French country, but now I like to mix French country with cottage, traditional and industrial touches. Obviously, I love the country style, but it has changed over the times. I’m in my mid forties now and can finally afford to actually carry out many of my ideas as well as get help from my older kids! I believe you should keep resale in mind when updating your house, by not making permanent structural changes to your home unless it would add value to your home. Paint color can be easily changed when the time comes. My sister decided to redo her small kitchen in her 60s ranch house by removing the walls between the dining room and family room and making them all one room! Her husband made all of the choices and put giant counter tops in that went all the way to the sliding glass door that had been in the family room. The family room also had a fireplace in it. Now it’s in the kitchen with no space to sit in front of it or enjoy it. It is actually part of the walking area to get to the back door. He also surrounded the fridge with about 10ft of cabinets. The kitchen, which is 3x the size it had been, now actually looks smaller! If they had chosen just to make cosmetic updates she would still have 3 rooms instead of one long kitchen! A remodel that is timeless and not trendy is often difficult to pull off–especially in the kitchen! I converted a small bedroom into an office/craft room years ago by installing permanent cabinets. I now wish I would have installed shelves and repurposed furniture so that the room was not “permanently” a craft room. I love all you updates! Just beautiful! How is the beadboard wall paper holding up around the toilet area? Is it scrubbable? I put it up in the kitchen, but I was scared to put it in the bathroom. It’s held up great! No issues at all and using a semi-gloss paint over the beadboard wallpaper allows for easy cleaning. I certainly prefer the ‘after’ of the kitchen. It feels way more open and inviting. That is by FAR my favorite transformation. First, I love the kitchen update! You did a great job, and while the “before” was pretty, the update is much better for today’s market. Second, I hate wallpaper, but love the pattern you chose. Wallpaper is not always an evil, especially when it looks neat and clean and is not a pattern that blasts your eyeballs out of your head. 🙂 The updates outside are gorgeous! Your entire home is beautiful and you should be very pleased and proud of the hard work and changes you’ve made. The board and batten is spot on! Have a great evening! 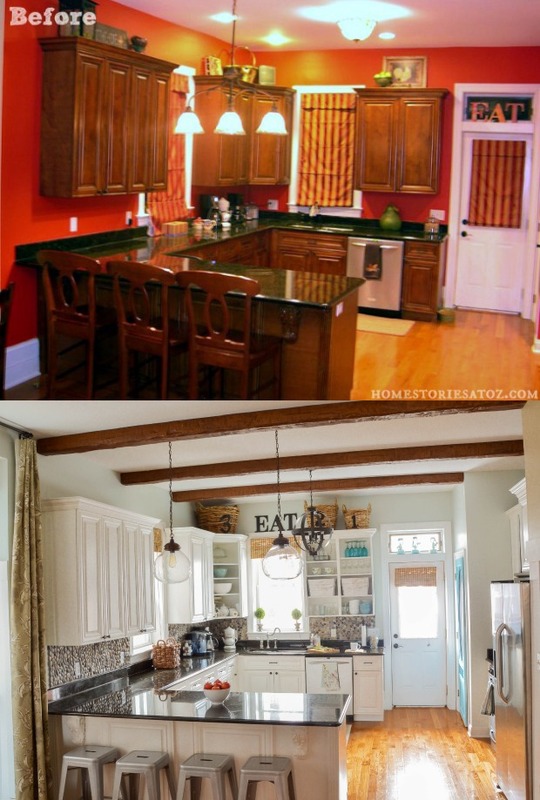 LOVE your kitchen re-do! And your decorating style overall! I also painted my kitchen cabinets about five years ago, but I have not been too pleased with the durability of the paint I used. Can I ask what paint (brand & finish) that you used? Thanks for sharing!!! 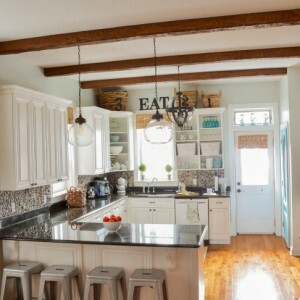 I just found this post and I quickly looked to see…where did you find your wood beams? You cant be everything to anyone so you may as well enjoy your home. Congrats! Great article, thank you for sharing. As an interior designer and very aware of resale value I honestly believe that your home should be your safe haven and a place you love to be in. It is a difficult fast moving life we lead today and I think it is it important to love your home. Resale values are important but they should not and can not rule your decision making on creating your sanctuary. Painted wood can be striped back, wallpaper can be removed. 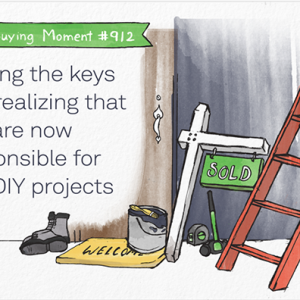 If a potential buyer is going to walk away from your house for these easy fixes they were not going to buy anyway. Live for today and enjoy. Beth, I love your changes, but may I say, I also loved what you had prior? Sounds crazy I know. But I have lived many years having to think “What would a buyer want” instead of what do I want. I’m not going to live that way any more. 90 % of the time, people redo the cosmetic stuff anyway. As a buyer, If I like the cabinet layout and appliances I figure I can make it my own with paint and lighting and my “stuff”. Wonderful ideas and great tips. Thanks for sharing! No, it doesn’t sound crazy at all! I loved all of my “befores” at one time or another, but my taste develops and changes over time. I like to see my home as my canvas, and I don’t worry about resale or what another buyer wants. I know when the time comes it will work out, and I’d much rather enjoy our space the way I want it for now. 🙂 Thanks so much for stopping by! I love everything you have done. The kitchen transformation is amazing. I love your bedroom too. 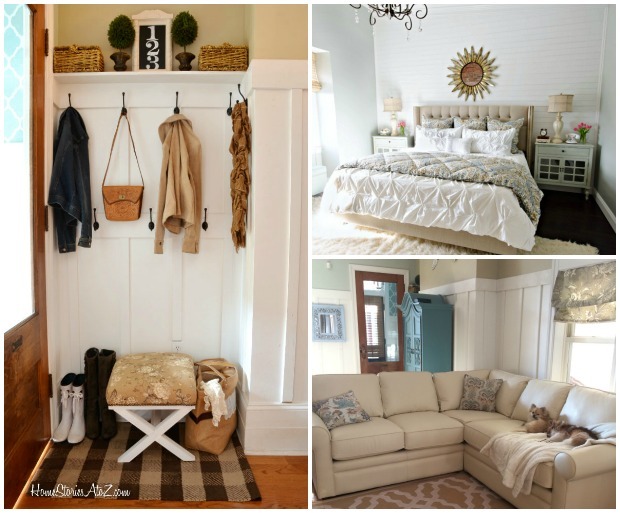 Where did you get your headboard and nightstands? Thanks Susan! The headboard is from Joss & Main and they actually have the headboard listed in one of their sales today: http://bit.ly/1ExSpic . The nightstands were purchased online from Kirkland’s, but I haven’t seen them listed recently. Hi Beth, Thanks for getting back to me so quickly. I’ll take a look at Joss & Main. May I ask where you got your duvet too? Looks like one that I have seen at West Elm. The duvet is from Crane & Canopy. But yes, West Elm carries a similar one. Thanks! As you can tell, I just love your bedroom! Your home is beautiful Beth! One thing’s for sure…if you were to list I’m sure it’d go quick! Thanks so much Jessica! I hope that if we do end up listing that proves to be true :). Great article! 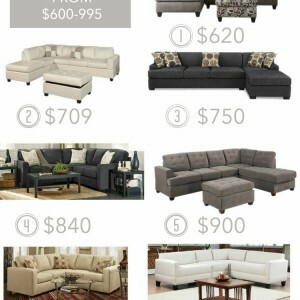 I’m getting ready to list soon, and am trying to create beauty in the home while on a budget! The thought of return in investments is always on my mind. I agree with the bathroom remodels and landscaping, that makes a big difference! My house is a twin in a small town in Pennsylvania, right on the street with a raised front porch and narrow backyard. The attic was burned in a fire that started in the twin. Due to vast water and smoke damage, the interior of the house was gutted and restored. I am making changes to make it reflect “me”. The kitchen cabinets remain one of those things upon which I cannot make a decision. I have added painted storage in the kitchen and could use the paint to do the cabinets. Resale issues are the only reason I haven’t painted them yet! Great article with lots of good information and links. Thanks!! Hi Suzan, it’s a tough decision! I don’t regret painting my cabinets one bit. I absolutely love how light and bright my kitchen feels and they have held up nicely so far. Thanks for stopping by and leaving a comment! I love white cabinets as well :). My mother has had white cabinets in her kitchen for almost 20 years and they still look fresh. It is what ultimately helped me make my decision to paint them. I too like white cabinets because they make the room look larger. My cabinets have a flat finish. I am thinking of selling and one thing that I plan to do is have them spray painted a high gloss oil based white. The glow of the gloss will set them off to make the room look even larger. One can never have enough light in the kitchen. Under the top cabinets lights is also an inexpensive way to add light.